To provide hours of outdoor fun for children, count on the sturdy, well-constructed vinyl swing sets and playhouses built by Adventure World Playsets. These fine vinyl playsets reflect careful manufacturing and attention to detail. You’ll enjoy the option of customizing these Amish-made playsets to fit your family. We take pride in crafting some truly exceptional vinyl swing sets. Today, home builders often rely upon vinyl exteriors to help protect commercial buildings and dwellings from the elements. This tough, attractive material resists the damaging impacts of water and snow; it won’t fade in bright sunlight, either. These Vinyl swing sets remain safe and attractive even after years of robust use. You may decide to add other items from our inventory to your yard to create an even more exceptional play area. Consider ordering durable outdoor furniture, too. We’ll help you select long-lasting, high-quality picnic tables, sandboxes, covered porch swings, and other lawn and garden improvements. We invite you to spend some time perusing our diverse inventory. Our company prioritizes safety features when building our kids playsets. These products utilize high quality components and building materials. 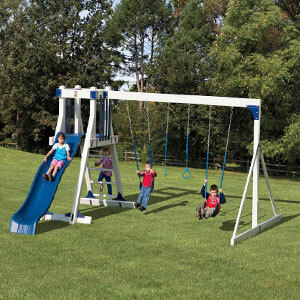 We carry a dazzling array of attractive Amish-made outdoor playsets and swing sets. Simply put, our goal is to design products to provide hours of fun and entertainment for youngsters. Our maintenance-free playsets enable young children to obtain pleasant outdoor exercise while they develop strength and muscle coordination. Our kids playsets allow you to tailor your recreational facilities to fit the needs of a growing household. For example, you can gradually expand play areas if desired by adding extra swing beams, towers, rooftops, and accessory arms. Use these features to help customize and enhance our vinyl swing sets to fit your youngsters’ recreational needs. Adventure World Playsets also offers durable lines of outdoor furniture. These products can help your family enjoy quality time together outdoors. Visit us to find waterproof vinyl picnic tables and benches. In addition, we carry durable customizable sandboxes. We offer these items, too, plus vinyl loveseat swings and covered vinyl loveseat swings. Since we love adding great items to our inventory, you’ll want to return often to discover attractive vinyl-covered furniture and accessories.